The software and program market are full of blogging tools made for creators, marketers, graphic designers, and more. Since a decade ago, blogging gained popularity and spread to many different fields. Nowadays you would be hard pressed to find a business that did not have a blog on their website. Blogs are used for marketing, for expressing creativity, and some even use it for therapeutic purposes. The point is, that blogging is not going anywhere anytime soon. 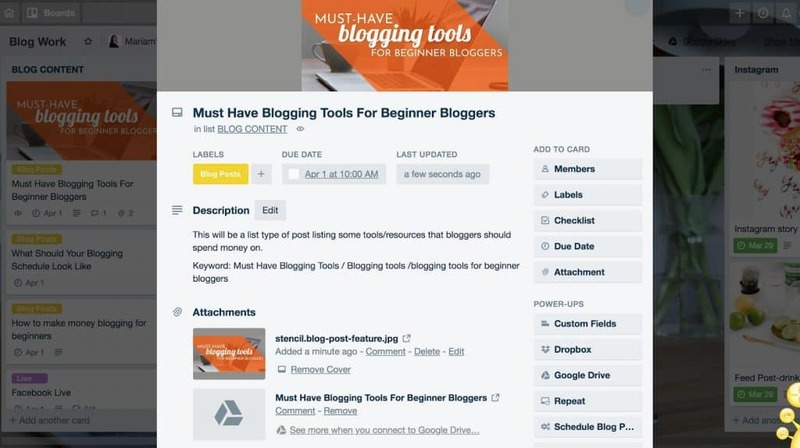 Blogging tools serve different purposes and help with various part of blogging. The fields mentioned above are not the only ones, these are but a few only. Different tools and software have different purposes and use cases. Some are free, some are paid. They can be used for different purposes such as productivity, optimization, image graphic creation, social sharing, and much more. There are several tools that I consider must-have for bloggers. Of course, this is my own opinion and preference. The way I made this list of suggested tools is by taking into account the income of most bloggers. For most bloggers out there, money is an issue. We all blog to make money, so the last thing you want is to spend money on a tool or resource that is not essential for your success. 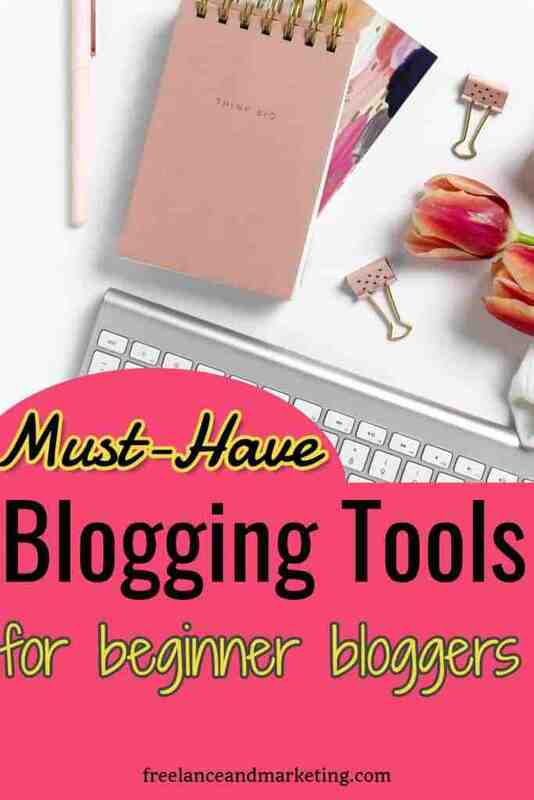 Of course, if you’re in a place to be able to afford spending decent amount of money on your blogging tools, then this list probably won’t be very helpful for you, as there are other premium options out there. Disclaimer: This post may contain affiliate links for certain products. These are products I use and love and think would beneficial for other bloggers. If you purchase a product through one of my links, then I will get a small commission. This will not cost extra money to you. I will make clear which links are affiliate links. To determine the exact tools a blogger must have, I like to separate them into categories, then select from the options under each category. Here are the tools that I think bloggers, and especially beginner bloggers should start with. Now keep in mind that some of these tools have Premium versions, which means that if you get the paid option, then obviously you’ll have access to more features and capabilities. Content creation is an absolute inseparable part of blogging. You can create your content by writing blog posts, filming videos, or doing podcasts. If you write blog posts, then a tool that catches grammatical and spelling errors is helpful. One such tool is Grammarly. It has both free and premium versions. The free version is a Chrome Extension that gets the job done. I’ve used the Premium version for some time. It was great, and it definitely had more capabilities. For personal reasons, I canceled my premium subscription and continued with the free version. For recognizing typos and other types of mistakes, the free version of Grammarly is great. I think every blogger should pay attention to their posts, how they’re written, and whether there are obvious mistakes. It takes away from your credibility as an authority figure in your niche. To continue with this theme, there is another free tool that helps with your writing. 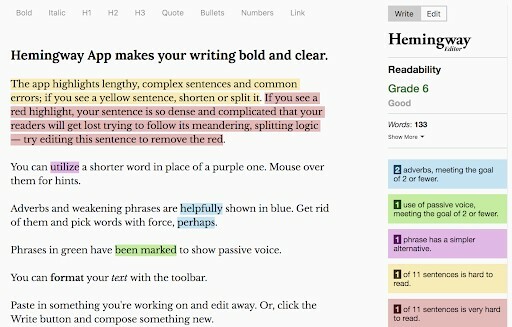 It’s the Hemingway Editor, and this tool analyzes your sentence structure and syntax. Hemingway Editor does not always tell you how to fix it or make the sentence better. However, it does highlight the sentences and words that it finds problematic. You then have to edit it until the highlighted part goes away. Between Grammarly and Hemingway Editor, you should be able to publish a blog post that doesn’t have any mistakes on its face. Another free tool to have in your toolkit for blogging is Google Drive with Google Docs, Google Sheets, Google Slides, and much more. I am an avid Google Suites girl and love Google products. I use Google Docs for writing my blog posts. I like to keep a record of all my posts in entirety in case something goes wrong with my website, and the backup fails also. Yes, I am a little paranoid. I love the fact that I can work in Google Drive without worrying about saving anything. Moreover, I can on my blog posts from my desktop, laptop, or phone. You can easily continue from where you left off. Sure, there are other writing tools and cloud storage options available, but none of them have the convenience of Google Drive and its applications. Do you want to build your email list? Do you want to know what to talk about to get your readers to subscribe? Do you want to have your content pre-planned to not stress out later? 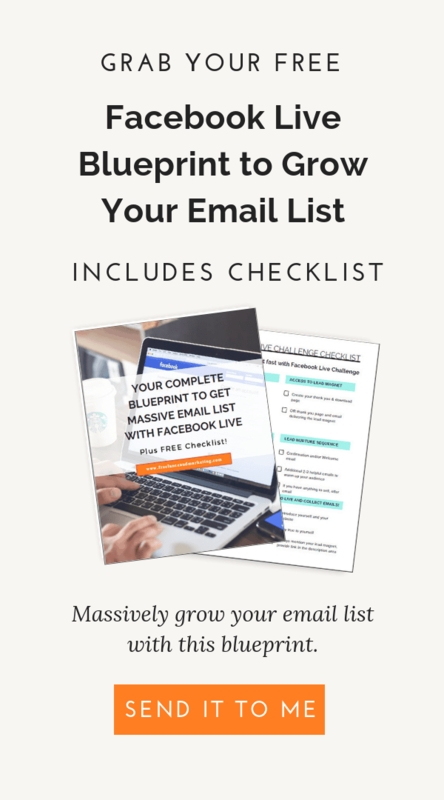 If you answered yes to any of the above questions, then download this FREE Content Plan & Strategy resource specifically created for email list building to jumpstart your process. Trello is not necessarily for writing or creating. Trello is an organization tool/calendar that keeps everything in one place, organized neatly so that you know at first glance what’s going on. You can add some power-ups (these are add-ons) to make your Trello boards super powerful and functional. In Trello you can collaborate with your teammates, you can even video chat with them, create a multilevel calendar, labeled cards, and much more. This online organizing tool is super versatile. I use it for blogging, I use for personal reasons, and I even use it for my law practice. keep track of my deadlines, etc. To say that I love Trello is an understatement. Best of all, you can use it for absolutely free. I personally have the paid option, but that’s only because I also use it for my law practice, and need the security that comes with the paid plan. Trello also seamlessly integrates with many important platforms and software, among which is Google Drive. Look at the image below to see how I organized this blog post in my Trello card. I even have a checklist for the things I must do before publishing, but that part’s not visible in the photo. This kind of organization and planning helps me to start and finish multiple blog posts very quickly. When you have a blog or website, then you almost necessarily need to have a tool for creating graphics and images for both your website and social media. Images add to the aesthetic value of your website. Moreover, they help with Search Engine Optimization (SEO). One of the most important reasons for having graphics and images on your site is that they help your reader stay on your page much longer. This is one of the most important ranking factors now. Stencil (affiliate link) is an online or cloud-based program that allows you to create many different types of graphics for your blogs, for your social media, etc. There are ready-made templates that you can use and customize, as well as photos, icons, and much more. However, if you use the free version of Stencil, it’s very limited, and you don’t have access to templates. A couple of features that stand out for me in Stencil are how easy it is to resize your graphics. Let’s say you made a graphic for Instagram, and now you want to make a matching graphic for your blog featured image. This is super easy to do, as you just need to click on the button that says resize and choosing what you want it to resize to. You also have the ability to make backgrounds transparent, even with the free version. However, the best feature of Stencil and the main reason why I placed it before Canva is that they’re integrated with the WordPress Media library. It just eliminates the need to work on graphics on an outside program, download it, then upload it to your site. If you like to try Stencil, you can use my link. The downside to Stencil is that it doesn’t have as many templates as let’s say Canva. Also, the free plan is extremely limited. However, out of all the options, I believe that Stencil makes it possible to create your graphics the fastest. Canva is another great online based graphics creation platform. In Canva, you can do anything. You can create beautiful PDFs, worksheets, planners, social media graphics, blog graphics, etc. Canva has both a free and paid version. Their paid version is called Canva for Work. Even the free version of Canva is amazing, and most people use that without any problems. Canva possibly has more templates and photos available than any other graphics creation tool out there. Canva’s free version, however, is missing a few important features that are present in the paid option. As a free user, you can’t automatically resize your photos or graphics the way we can do them in Stencil. With the paid version of Canva you do have this feature, and it’s wonderful. You also don’t have access to downloading images with transparent backgrounds. This particular feature is one that I use a lot. Therefore, I either have to pay for Canva for Work or find other means of getting transparent backgrounds. GIMP is something I’ve discovered recently. It’s an open source platform, which means it’s absolutely free. GIMP is pretty much like Photoshop’s messier cousin. They’re extremely similar, and you can do almost anything in GIMP that you do with Photoshop. There are some tutorials available on how to use this platform and how to get many different results. I am not that savvy with technology, but even I was able to figure out how to use this, and get what I want. For those who need more mage manipulation or a program like photoshop, but want it free, check out GIMP. When blogging or creating content in any form, you might need to record a tutorial or a video presentation. There are multiple tools out there that can handle this task. Most of them, however, are paid software and programs. Depending on what you choose, you’ll have some features available in one, and others in other software. For beginner bloggers, especially when you’re trying to be money conscious, I think you should try to choose something that doesn’t cost much. For most of my screen recording and webcam recording purposes, I really love Loom. It’s a software that has both free and paid versions. I used the free version for a long time before I decided to transition to the paid version at $10/month. With Loom you can record your screen, you can record yourself through your webcam, or you can do both at the same time. It’s not as feature packed as let’s something like Camtasia or Screenflow, but it gets the job done. You have the ability to trim your video, which is what most people need in the beginning when it comes to filming. I upgraded to the paid version because I wanted to continue using Loom to create my online course on a blog content plan & strategy. So far it’s working great, and I don’t feel the need for more expensive software. Give it a try if you want to film tutorials or do other types of videos. Social media scheduling tool an important part of a blogger’s social media presence and success. If utilized properly, it will save you a lot of time and energy. The way I work is usually batch my social media for the week, and forget about it. Unless I have something special that pops up and is not part of my regular schedule, then I will manually add to the schedule. With that said, however, you want to be careful what platforms you schedule your posts on with an automatic scheduler. Facebook is notorious for this, as they don’t really like third-party schedulers since they have that option on Facebook. My approach to posting on Facebook is a little bit different from other platforms. Since I have a Facebook page for my blog, and my main concern is to create engagement on my pages, I try not to schedule too many automated messages. I’ll usually post a question, quiz, survey, or something fun that requires a response from my page followers and people who liked it. I only schedule my blog posts and my freebies to be posted through a scheduler once a day. 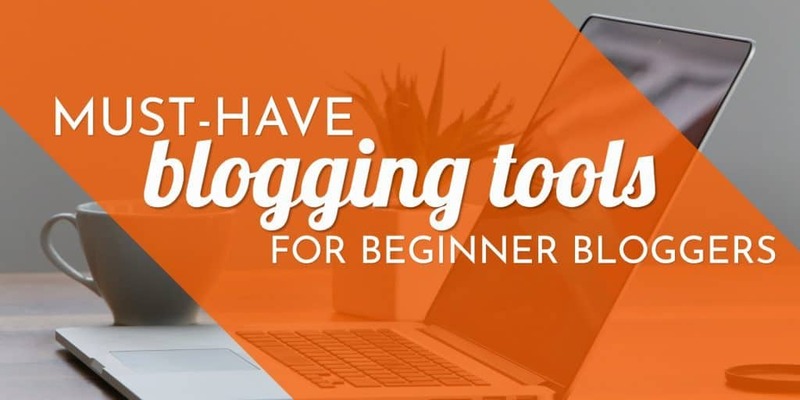 Regardless, here are the tools that I recommend for beginner bloggers or for those on a budget. Buffer is a trustworthy, well-priced social media scheduling tool. It also has a generous free version, where you can use it for up to 3 social media profiles, and schedule up to 10 posts in advance for each social account. I’ve used Buffer free, and I’ve used Buffer Pro. I loved the Pro version obviously more because it had more options and features available. However, for someone starting out or on a tight budget, I believe you can easily use Buffer free plan for some time. Hootsuite and Buffer are what I call natural competitors. They are similar yet different from one another. Hootsuite also has a free plan. Like Buffer, its free plan is limited but still generous enough. The main appeal for me with Hootsuite is that it lets you schedule Pinterest pins with its free plan, something that you can do with Buffer. I really like scheduling my Pinterest pins with Hootsuite free plan. It’s super similar to Tailwind, which is considered the main Pinterest pin scheduler. I love that I am able to pin to multiple boards at the same time, then I can go and change the times if need be. Obviously, the free plan only allows you to post a limited number of pins. However, if you want to upgrade to the paid option, you can have this one tool to use for all your social media profiles. Tailwind is a scheduling tool for your Pinterest pins. They also have a version for Instagram now. Many bloggers and online entrepreneurs consider Tailwind an important part of their Pinterest success. My one advice would be to test everything out for yourself. What works for one person might not work for you, and vice versa. Tailwind makes is super easy to keep a regular schedule for your Pinterest. You can schedule up to 400 if you’re on a month to month pay-plan, or unlimited pins if you’re paying annually. You can also directly save other people’s pins to your Tailwind account and basically have them be scheduled to go out at your specified times. Email marketing is possibly one of my favorite areas, and I give a lot of my time to it. I make sure I do at least one task a day that’s gonna help me further build my email list. Whether it’s creating new freebies or lead magnets, or promoting old ones I always build my email list. This is something I highly recommend all bloggers, whether beginner or expert, continuously do. There is no such thing as having “enough” people on your email list. I have talked about email marketing, email service providers and lead generation tools in my previous posts. 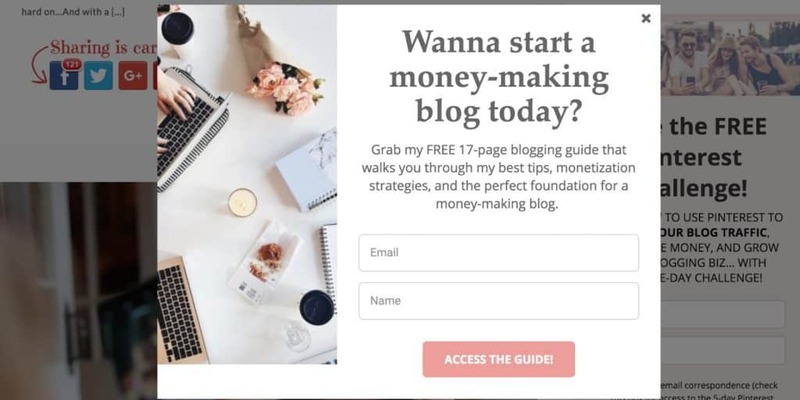 If you want options and details, you can check out my post on How to Start a Blog and Make Money From It. Another one of my previous posts shows you how to quickly build your email list as a new blogger or solopreneur. You can find that post here. There are several lead generation tools out there that you can use for your blog and building your email list. Some tools are a part of your email service provider, others are a separate lead generation and capture tools. For bloggers who have financial limitations, you can start by using the forms present in your email service provider as you already have them. I’ll discuss those in a second. For now let’s look at individual lead generation tools. Sumo (formerly Sumo Me) is an amazing suite of tools, including lead generation that you can use for your website. There is a WordPress plugin that you can use. Sumo has a very reliable lead generation and collection component. To this day, Sumo is probably the one plugin that I can always count on to work. A word of warning though, Sumo is considered what is referred to as a “resource hog” in the blogging world. This means that it might slow down your site little bit. You have to decide for yourself if you want to try it. As with most other blogging tools, Sumo has free and paid versions. Obviously with the paid version you get much more. However, if you’re just starting out or money is an issue, it’s my belief that Sumo will help you greatly. One of my all-time favorite lead generation and capture tools is Thrive Leads (affiliate link) by Thrive Themes. This is not a free plugin. However, it’s very affordable, and it’s a one-time fee, instead of a subscription. In fact, Thrive Themes have many great products that are very beneficial for bloggers at an extremely reasonable price. I myself have all of their products, and couldn’t be happier. If you’re collecting emails, then you need to have an email service provider to be able to email your list members, send them your lead magnets, and eventually sell to them. Your email list is your most precious commodity as a blogger and online entrepreneur. It is by far your most powerful blogging tool. There are many different email service providers that have different features, prices, capabilities and systems. You have to pick one that works best for you. There are two free choices that are great places to start. MailChimp allows you to use its free tier for up to 2000 subscribers absolutely free. One great advantage of using MailChimp is that it integrates with everything. You’re never gonna have a problem with connecting your email service provider with other programs and tools. However, MailChimp’s free tier is not as advanced as MailerLite’s. MailerLite is a relative newcomer into the email service provider field. The company works hard to build more and more integrations for its service. MailerLite allows you to have a free account for up to 1000 subscribers. Then afterwards you transition to their paid plans, which are still very affordable compared to most email services providers. 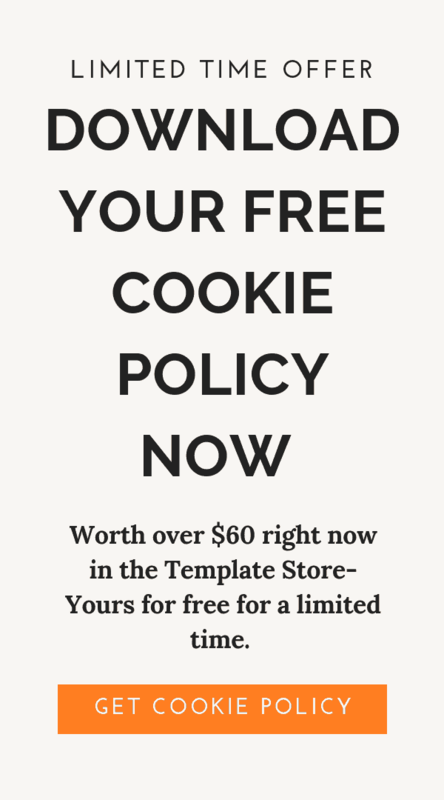 One area where you have to be careful with both MailChimp and MailerLite is using affiliate links in your email. They don’t like it it and its actually forbidden according to both of their terms of service. MailChimp is very strict and shuts down your account. MailerLite seems to have a hit or miss type of approach. I know several accounts that go shut down, yet I also know several other that successfully continue using affiliate links in their emails. Just be careful. Both MailChimp and MailerLite have beautiful lead generation and capture forms and landing pages. For those who do not want to get a separate tool, you can use the forms already in the email service provider. One of my favorite bloggers, Cate from Sweetandsimplelife.com uses MailerLite forms. I loved her opt-ins before I knew they were Mailerlite. Her forms are beautiful, elegant and minimalistic. Many bloggers prefer to use the forms provided by their email service provider because they connect better with the email and there are no discrepancies of the contact not going into your email sequence. There are two email service providers that I love and use. I would recommend these two options to anyone without a moment’s of hesitation. First option, ConvertKit (affiliate link), is a favorite among bloggers and for good reason. It’s an advanced email service provider that has workflows, automations, rules, tagging, segmentation, and much more. ConvertKit was created specifically for bloggers. For this reason, some things like delivering a freebie, getting a confirmation are super simple and fast. You can’t go wrong with ConvertKit (aff. link). They also have beautiful opt-in forms and landing pages that you can use for your website and lead generation without having to pay for an additional service. My next recommendation and by far the most powerful one, is ActiveCampaign (affiliate link). ActiveCampaign is a full marketing suite. There is nothing that you can’t do with ActiveCampaign. You can create any type of automation or workflow you want. You can segment and tag your list as much as you want. There is nothing that this email service provider cannot handle. Their prices are divided into 3 separate tiers and also go up and down based on your subscriber count. ActiveCampaign (aff. link) most affordable plan is its Lite plan, and if you have 500 or less subscriber, you only have to pay $9/month if you pay annually. However, don’t be fooled by the name of the plan. There is nothing lite about it. It’s still more powerful than most email service providers out there. The current market is saturated with all kind of blogging tools. There are many different versions of the same tool selling for different prices. The trick is not to let the tech part or the tool selection to cripple your creativity and blogging journey. Pick something that works, and is good enough for you at the moment. Remember that you can change at any time. Just pick something to get started. All the tools listed above are ones that I personally use or used. I believe they will benefit you and help you in your blogging journey. If you enjoyed this post, please comment below and/or share it with others. Thanks for stopping by. Good to have more info on tools needed. There are so many things out there I don’t know about and there were many on here that I’ve never heard of. Filing away the info for when I need it. I’m still learning a lot. I’m a newbie. Thanks for this. This is a one-stop shop for blogging tools. I am always looking for a way to make my blogging work easier. And one interesting tool I have found here is trello. I intend to try it out. Hi Eki! Thanks for stopping by. I understand the desire to constantly look for tools. I myself am like that also. You’ll love Trello! It’s a lifesaver for me, and the only way I keep ahead of my crazy schedule. Wow. Tons of awesome tools that we all need. It is hard to weed through all of it, especially as a new blogger. I need to check out Trello, that is my next adventure!